I am so excited to have Tania Colamarino back her guest posting for the final S’mores Saturdays with these Funnel Cake French Fries with S’mores Dip! Tania is a food photographer and food stylist. She has been privileged to work with some of the best in the industry, including Carlos Bakery from The Cake Boss, Anne Heap of the Pink Cake Box, Make my Cake in Harlem, and more. She also has 2 books, one of which features a full 35 recipes all shot and styled by her, and various magazines, including Bake Magazine. Be sure to check out her blog and website. So here it is, the last hoorah, the last weekend of summer before school starts and we bust out the notebooks for more than recipes. With fall around the corner, I fondly think of this past summer and my favorite things. 2 of those favorites are -Funnel Cake and S’mores. 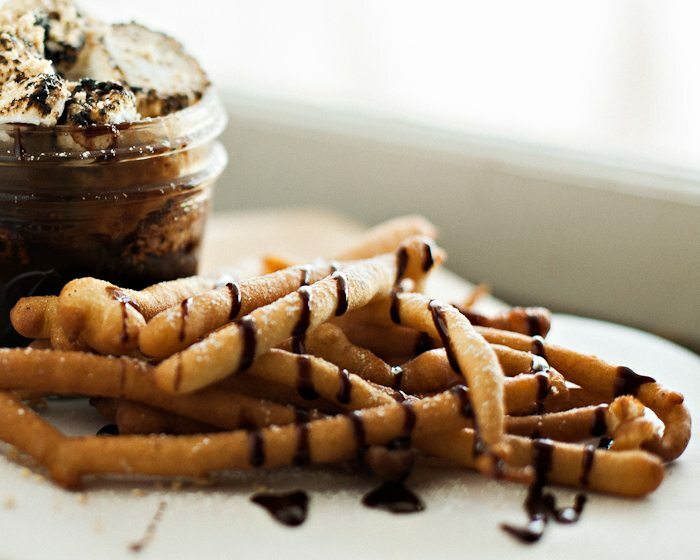 This, my friends, is how the S’more’s Dip with funnel cake French fries was born! I hope you enjoy this as much as our family does, and I hope that your fall is as awesome and sweet as your summer has been. Heat oil in saucepan or deep fryer. In a large bowl mix eggs, milk, vanilla, sugar and salt. Slowly add sifted flour into the mix. Your batter should be the consistency of pancake batter. To make the fries easy to fry, place the batter in a piping bag with a small circular tip for ease. Once you begin to fry your FCF, remove them once golden in color. In a small ramekin, pour ¼ cup of Hershey’s chocolate syrup. 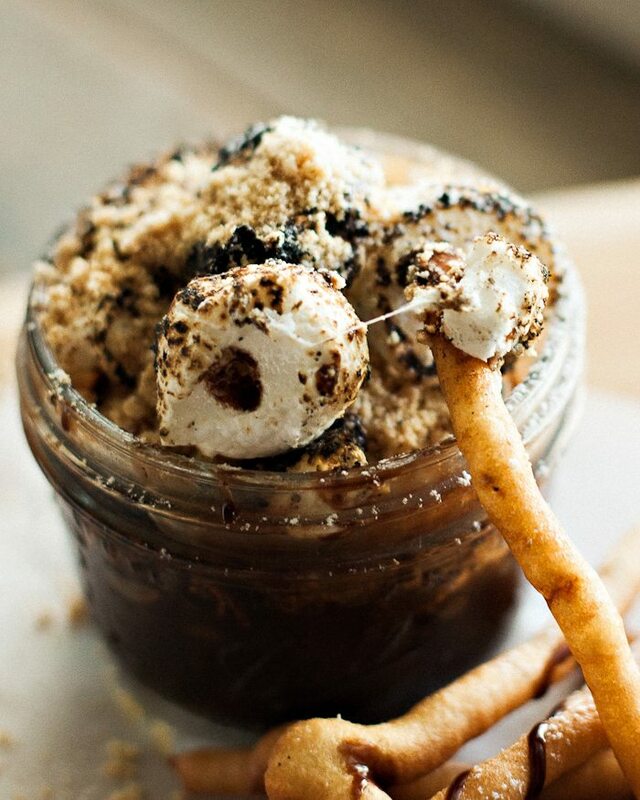 Add roasted marshmallows and crumble graham crackers on top. And then…. You dip baby dip! Enjoy! This looks so sinful! I need this in my life right now. I think my kids would share in the love of this too! I’d love for you to come share with us at tonights Throwback Thursday link party at 6pm CST! What?! OMG – this is FABULOUS! I would have never thought to make funnel cake french fries. I absolutely love this idea. I can’t wait to try it. Pinned! Sarah, this is looking delicious! YAY!!! Thanks, Desiree! You, and your blog, are my favorite! Funnel cake is my favorite fair food. The fries idea is a great one for a dipping sauce Thanks for joining us on Oh My Heartsie Girl Wordless Wednesday! These look amazing! Thank you for linking up to last week’s Tasty Tuesday link up. I have pinned your recipe to the Creative K Tasty Tuesday Pinterest board. I hope that you’ll join us again this week. 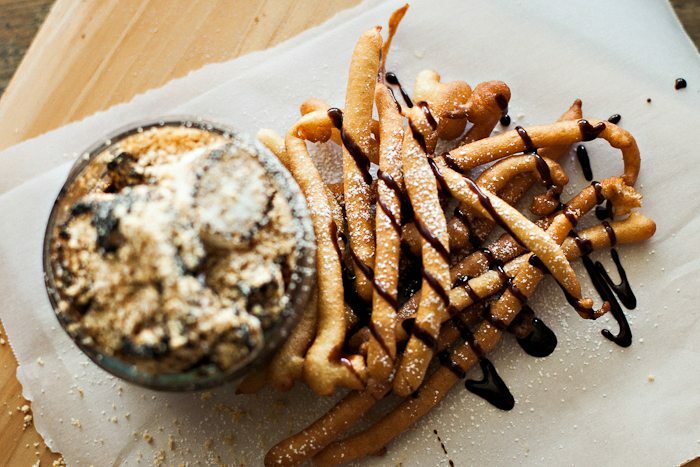 Tania’s funnel cake fries recipe is SPOT ON! These have just the right amount of sweetness – and the batter was very easy to work with. The first recipe I tried resulted in batter so thick there was no way I could pour it into a funnel in order to transfer it into a large condiment squeeze bottle. But this recipe? Wonderful. Also: easy, and most importantly, DELICIOUS! My kids would love to not only make them but eat them as well. Ok, I need these in my belly stat. They look sooooo good!! I’m seeing more and more of the sweet fries and dip! This sounds really yummy! Thanks for sharing on the What’s for Dinner link up! Wow, I am drooling over here. Thanks for sharing your wonderful posts at Over The Moon Party.